Hi! 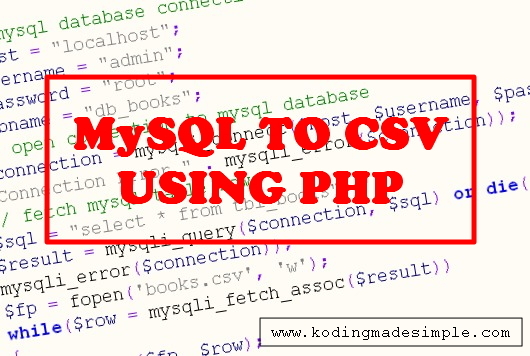 We'll see in this PHP Tutorial, How to Export Data from MySQL to CSV File in PHP. It's not uncommon to import and export data from database management system. Sometimes you may want to export the data from database into CSV format as the term CSV stands for comma separated value and it's a good human readable format like JSON. PHP 5.1 and above supports the csv formatting function fputcsv(), and combining it with PHP's file handling functions we can very easily convert the mysql table to a csv file. First of all run this sql statement to create mysql table to use as an example for this tutorial. To convert the mysql data to csv file go through the below steps one by one. First let's establish the database connection to mysql using php function mysqli_connect(). Once we established the connection to the database, we have to fetch the records from the mysql table which we want to export in csv format. Say we want to export the books list from the table ‘tbl_books’, it can be done using php function mysqli_query(). Next we have to write down the mysql resultset records one by one to a csv file. For that we have to create a csv file, loop through the database resultset we got from step-2 and write one row at a time to the file. fopen('books.csv', 'w') will create a csv file with the name ‘books’ and set to writing mode. fputcsv($fp, $row) will format the data contained in ‘$row’ as CSV and write down it to the file handle ‘$fp’. Learn more about fputcsv() here. fclose($fp) will close the opened file handler. After completely writing up the result set data to the csv file, finally close the database connection we have established in step-1. Here is the complete php snippet to convert mysql into csv format. With the help of the above php code, you can very easily Export MySQL Database to CSV File. If you want to learn the reverse process of importing the csv file into mysql database then check out this tutorial. Checkout Great beginning php tutorials Very clear and helpful for beginners. There is problem with this code in conversion from mysql data to the csv , the error shown are as follows..
Hi, it seems you don't have write access to the file. Please change the folder permission to 777 or similar (read & write) as administrator and try. i got the csv file but the data gets duplicating. The code works fine. Please make sure you don't have duplicate entries in the database. In such case, if you want to remove duplicated rows, you can filter out in the sql query. Thanks for the explanation. I am trying to put a header row before the rows that contain the data. I put fputcsv('SKU', 'Qty'); before the while loop and it doesn't seem to work. Any clue? I have a problem. I have 5 columns. But i don't get line breaks. Everything is comma separated. And, the first row fifth column's data concatenates with the second row first column data. Please help. It works completely fine but if i want to show the data in csv format on a webpage then what to do ? Hey! Your question is not clear. Do you want to embed csv file in the webpage directly or to just display the records with columns separated with ; ? If it's latter just loop through the resultset and use echo statement. Hi, I tried to put this exporting function into button so user can click on button and export it but it is not working. Did i do smth wrong?